Good afternoon, lovelies! It's been quiet around here, lately. There are cobwebs in my code and a virtual tumbleweed just bobbled by. The utter silence would, quite rightly, lead you to draw conclusions. Has Mary run off to join the circus? Is she finally pursuing her dream (read: utter nightmare) of traveling the world in a festively dangerous hot air balloon? Oh, I bet she and Sam have turned their backyard into an artisanal string cheese shop! Alas, no. We're all out of grand adventures here! Since the beginning of July, I've mostly been sitting in front of my computer in yoga pants, writing away on two books, and furtively glancing at the calendar. Occasionally, I will mumble, "Why did I say these books would be done by September? Whhhhhhy?" There was a break for RWA, a brief trip to Utah with my love, and the exciting news of my Avon Fanlit grand prize win. Mostly though, it's just the typing and muttering. Until, I got a lovely email from Mari of Seamster Patterns. She's spearheading Sewing Indie Month, this year, which kicked off with an independent pattern bundle sale. 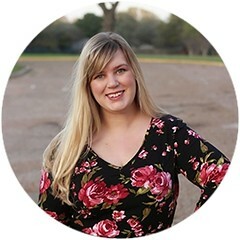 I jumped on board to join the blog tour! Not only did it get me out of yoga pants, but it got me back to my sewing machine. That's a win, kittens. There are ten patterns in this bundle, each cuter than the last. Initially, I was tempted to sew up the Bonnell Dress from Dixie DIY, which is named for a beloved Austin landmark and the very same place Sam proposed to me. 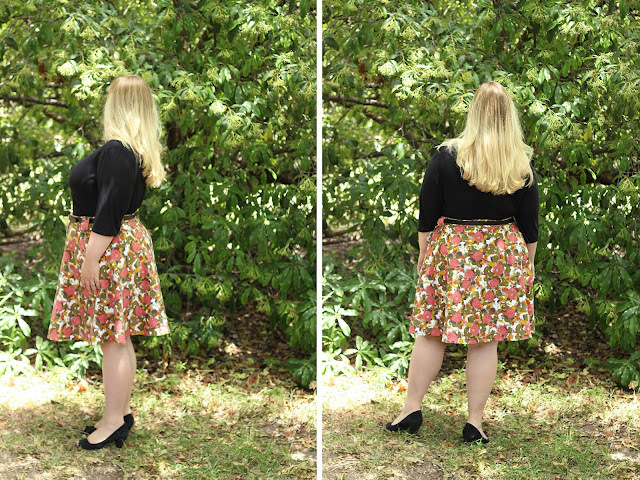 In the end, however, my practical soul chose the Cressida Skirt from Jennifer Lauren Vintage. My wardrobe desperately needs more separates right now and, to rationalize taking time away from deadline hell, it made sense to fill that niche. Cressida, like all of Jennifer's patterns, is a modern twist on vintage fashion. This semi-circular skirt has a wide waistband, stylized button tabs, and options for either a single or double button front placket. It's also exactly the silhouette I like in a skirt: defined waist and swooshy hem. My fashion goal, as I enter my thirties, is to become Juliette Binoche in Chocolat. 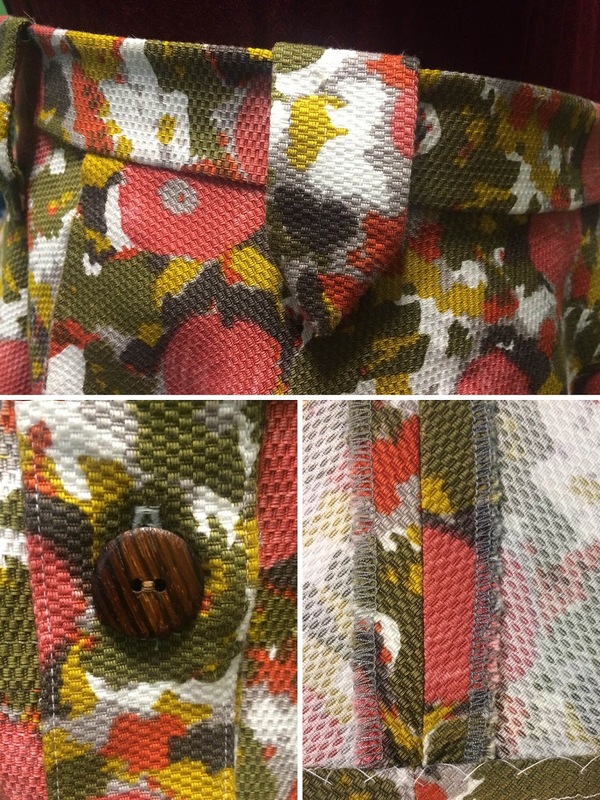 For this single-button version of Cressida, I chose a fabric that will easily take me into the cooler seasons. I bought this gorgeous cotton pique--a poppy print in coral, mustard, cream, and olive--in a tiny San Francisco fabric store sometime in 2009. (At the same time, I bought its sister colorway, which was used years ago on a rarely-worn Macaron dress.) The fabric works well with both brown and black accents, making it one hell of a versatile little skirt. Construction-wise, the Cressida skirt is a very beginner-friendly pattern. As long as you stay-stitch that waistline quickly, you'll be fine. It has a ton of details to keep more advanced seamstresses happy, however. The turned-and-topstitched placket was a blast to put together, as were the pointed belt tabs. To finish off the skirt, I serged all the seams with gray thread and catch-stitched the hem in place. The real show-stopper on this skirt, though, are the buttons. They're a set of lovely dark wood buttons, re-purposed from a man's 1960s coat. I picked them up at a local antique shop, which has a dangerously impressive selection of vintage sewing notions. I cannot walk past a drawer of old buttons without pawing through them for hours, y'all. My sewing room is bursting with random collections of antique and vintage fastenings. 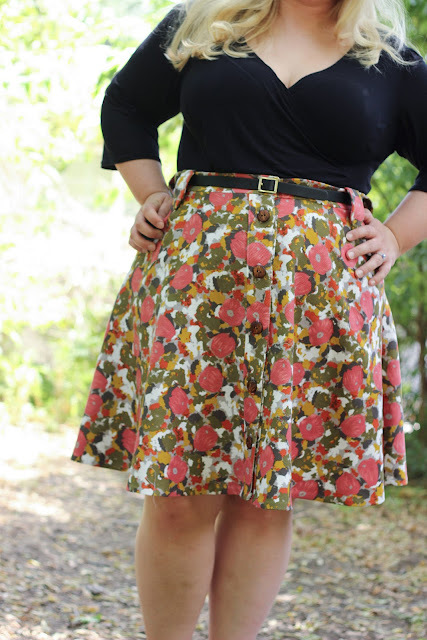 This skirt is exactly what I hoped for, when signing up for Sewing Indie Month. Not only was it a quick project, but it's one I've already worn multiple times. Thanks to the melange of colors in the fabric, it pairs easily with much of my wardrobe. In the run-up to RWA, I made a couple of easy rayon knit tops, like this black version of McCall's 6513. Each one looks outstanding with this skirt! I am already fantasizing about wearing it with boots and tights, once the fall actually rolls around. You know, in November. Are you ready for the cooler weather, friends? Or are you still relishing sundresses and shorts? This particular seasonal change always boosts my sewing creativity. It's about now that I start craving tweeds and jewel tones. This blog post is one of the last stops on the Sewing Indie Month Pattern Bundle blog tour. The sale actually ends tomorrow, August 12th, but there's still time to get on the action! 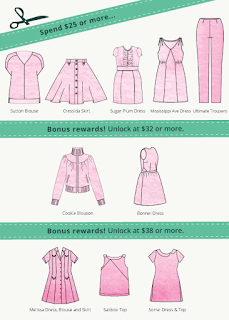 There's a tiered scale of paying for the bundle, with different patterns unlocking at $32 and $38. What's more, 20% of all donations go toward the International Folk Art Alliance, which provides exhibition and education opportunities for folk artists around the world. 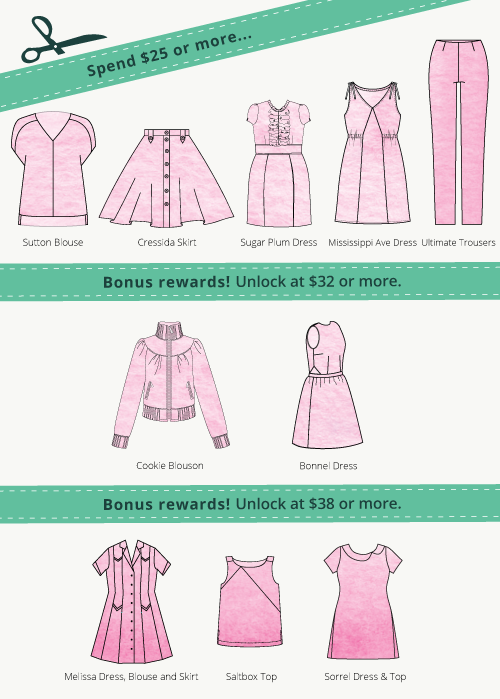 A complete list of the patterns can be found at the Sewing Indie Month website, along with more details about upcoming SIM events. 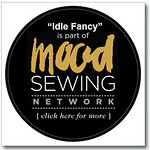 Note: In exchange for participating in the Sewing Indie Month blog tour, I received all patterns in the bundle for free. To offset my lack of purchase, I've also donated to the IFAA, which you can learn more about at this link.